Whether they’re aspiring artists, promising performers or passionate producers of prose and poetry, New Zealand children and teens have plenty of chances to express themselves – in and out of school. 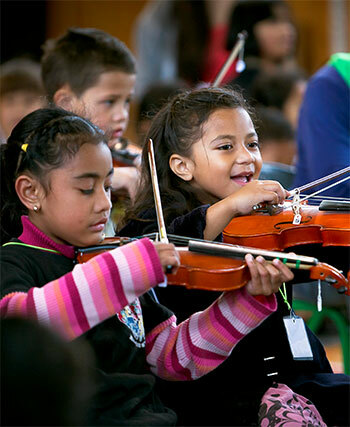 The New Zealand curriculum covers four arts areas – music, dance, drama and visual arts. Creative writing is a part of English. New Zealand’s high-achieving young musicians may become involved with the National Youth Orchestra, the National Youth Jazz Orchestra, the National Youth Brass Band or the New Zealand Youth Choir. There are also many regional groups to join. Smokefreerockquest is an annual competition for popular music, which has given many local musicians their break. Smokefree Pacifica Beats is a competition for contemporary acts that incorporate Māori and Pacific cultural elements. A range of festivals, competitions and classes encourage dance and drama. Student competitions for kapa haka (traditional Māori performance) take place regularly. The Sheilah Winn Shakespeare Festival gives secondary-school students the opportunity to direct and perform extracts from Shakespeare. Meanwhile, at Stage Challenge, large high-school teams perform dance and drama pieces they have created themselves. Several cities have youth theatre companies. Not-for-profit training programmes include the Michael King Young Writers Programme in Auckland and Christchurch’s School for Young Writers. Various short-story competitions cater for school students of all ages, while young poets can enter the National Schools Poetry competition run by Victoria University’s International Institute of Modern Letters. The Waikato Society of Arts runs the biennial National Youth Art Awards for 15–27 year olds, and Pop Youth Art Industries holds an annual art competition for 5–18 year olds. The Youthtown Creatifs Young Designer Awards are open to budding teenage fashion designers.